healthy eating | Live Healthy S.C. If you’re planning to give away your heart on Valentine’s Day, make sure it’s healthy! What better way to say I love you than preparing a healthy homemade meal for the one you love? Make this Valentine’s Day extra special by cooking at home. You will not only spoil that special someone, but you will also keep your heart and body happy by including heart healthy foods. Cook at home: Preparing a meal at home not only keeps your wallet happy but also keeps your body happy. Restaurants add lots of extra fats and salt to foods; when you are the cook you control the ingredients used. Share Your Sweets: Don’t overindulge in candy and chocolates given by loved ones. Remember there aren’t many nutritious benefits in these treats so watch portion sizes and eat only a small amount. If you need to, share with others to avoid going overboard. Plan an active date night: Instead on planning your date night around food and treats, do something fun like taking a romantic hike or going on a scenic bike ride. Think Red: Red is not only the color of love but red foods are good for your heart. Full of antioxidants, fiber, and key vitamins; including red foods can be a great way to celebrate love for each other and your heart. Don’t Deprive Yourself: Remember that the day is supposed to be focused on spending time with those you love. Enjoy the day and don’t be afraid to eat a small treat to celebrate. Dark Chocolate has been shown to have nutritious properties through its antioxidants benefiting our health. This entry was posted in Community Health, Disease Control, Prevention, Public Health and tagged healthy eating, heart disease, heart health, valentine's day on February 13, 2017 by SC DHEC. We’ve given you some tips for healthier snacking during Sunday’s big event, so how about some recipes? These delicious and nutritious treats are sure to be a touchdown! This entry was posted in Community Health, Outreach, Public Health and tagged healthy eating, recipes, snacks on February 3, 2017 by SC DHEC. Kids love Halloween – dressing up, going to parties and, of course, eating yummy treats. But parents need to keep some guidelines in mind to make sure the day is full of treats, not tricks. Use these tips to make the festivities SAFE and HEALTHY. Hand out some healthier treats for trick-or-treaters such as low-calorie treats and drinks. For party guests, offer a variety of fruits and vegetables. Exercise can be part of the fun. Use party games and trick-or-treat time as an opportunity for kids to get their daily dose of 60 minutes of physical activity. Avoid walking areas and stairs that aren’t well-lit and free of obstacles that could cause someone to fall. Test make-up in a small area first. Remove it before bedtime to prevent possible skin and eye irritation. Yes, a little candy is OK, but limit the sweet treats beyond the holiday. 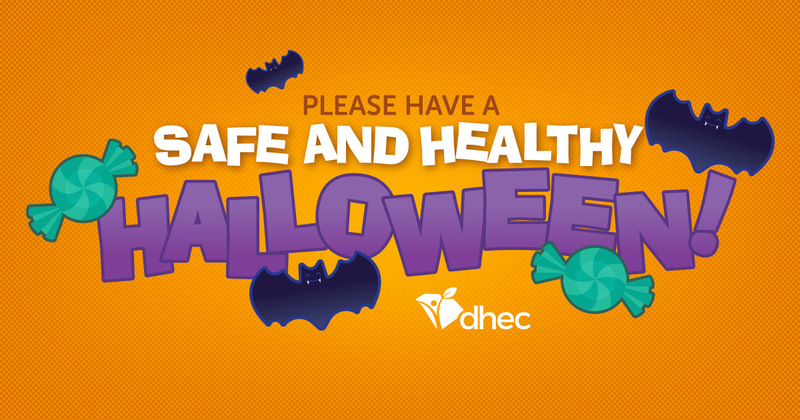 This entry was posted in Community Health, Public Health and tagged children, health, healthy eating, healthy holidays, holiday safety on October 28, 2016 by SC DHEC.